Howick Youth Council chairperson Jack Collins. The Howick Youth Council has this week launched youth-focused consultation on Auckland Transport’s plan to introduce a T2/Bus Lane on Pakuranga Road. The consultation aims to offer clarity around the views of youth in East Auckland and ensure that youth voices are heard in important decisions regarding public transport in East Auckland. “Youth are one of the key stakeholders in public transport because it’s usually our only means of getting around. 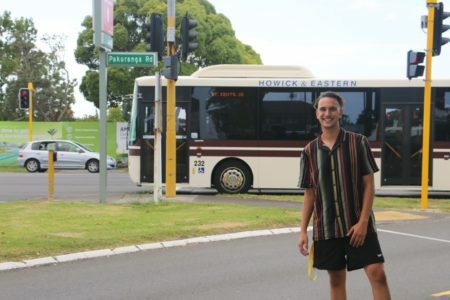 Auckland Transport should always conduct extensive consultation with youth when they make choices around public transport,” says Howick Youth Council chairperson Jack Collins. Collins is concerned that the lack of engagement is not a new issue. “When Auckland Transport bought in the new Eastern bus network at the end of 2017, a lot of young people expressed disappointment. The Howick Youth Council’s consultation survey can be found here.